Want To Know What ~500Km/h Rail Travel Looks Like? For $8 .....this is why the west is screwed! Uk train system hopelessly stuck in the early 70s. 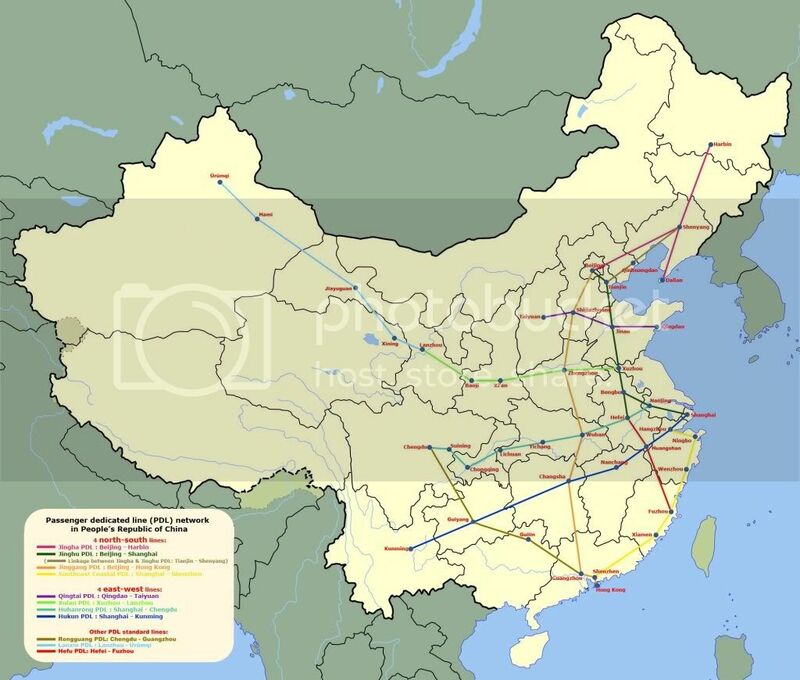 [wikipedia]...this grid is composed of 8 high-speed rail corridors, 4 running north-south and 4 traversing east-west, and has a total of 12,000 km. I mean, who's ever heard of Tanjn? It doesn't appear to be Maglev. I can see tracks at the station. Bet the drivers (if there are any) get £40k+benefits a year and Bob Crow giving the finger to commuters every other day. The newest one is the harmony railway system. I can vouch for this....why do we put up with such poor service and high prices? It really shows us what a crude, pathetic joke the UK rail system currently is. We're stuck going 80mph (or thereabouts - if we're lucky!) and it costs £25 (or near $50) for a 30 mile trip from Hampshire into London. It could be just the Shanghai bit is Maglev. In the video it looks like a maglev-type system. Even so, 270mph is not bad, eh? Heh they've also got to spend those US$ as quickly as possible before they get printed into oblivion.. I'd actually like to see a vacuum railway like Brunel envisaged, or have the entire railway put in a low pressure concrete tunnel so you have less air resistance = more speed for the same amount of juice... something to do with an inverse cube law or something which means you need more energy to push the air out of the way. 1000kmh trains ought to be possible with that kind of tech. I beleive it is the Shanghai Maglev, which runs from Shanghai Airport to the outskirts of Shanghai (about 30km). The cost was 1.33bn dollars according to wikipedia. A quick trawl through the wikipedia article shows pretty quickly that this is a showcase project. Commercially unviable but an amazing technological achievement, largely done by the Germans IIRC. I'm glad the government in this country doesn't spend money on this sort of nonsense. I'm not sure about the West being screwed. France and Spain already have the ultra-fast trains. 2.5 hours to go between Malaga and Madrid (550km), 3hrs Madrid Barcelona, though it does cost a bit more, around 100 euros return. I hate paying the £15 on the Gatwick express when it costs me 70 cents to get the train from Barcelona airport into the town centre. How can the same service cost 20 times more in London? Does it work in snow? Does it function if there are leaves on the line? If the answers are yes the clearly it's been designed by idiots and they should have hired Network Rail. You're right it is crude, nearly all the lines in the UK are stuck following an alignment decided more than a century ago when trains did 30mph. When a proposal for a new high speed line comes up, the same people moaning about the state of the network then start whining about the cost and about it being within 2 miles of their back garden. Now if our Govt. just demolished a few towns and evicted a few hundred thousand people I'm sure we'd get a 186mph line with a lot less problems. Seconded. I took the Shanghai maglev From Longyang Road to Pudong Airport at the end of a work trip in December 2008. The taxi driver who took me to the station told me that he could take me all the way to the airport for little more than the train fare, and that the whole thing was a colossal white elephant. It's ended up costing an order of magnitude more in maintenance than the German contractors who built it claimed, and plans to extend it to an inland city around 100 miles away had been shelved because the cost/benefit sums didn't even come close to adding up. It felt very impressive travelling at 200mph at ground level, but this technology clearly is not viable for a mass-transit system. The tickets were so expensive that most people going to the airport do indeed use taxis. The train was so well used that I had an entire carriage to myself - and this was on a weekday evening rush hour! What is really shows us, is what is achievable when you spend your money on real things rather than wasting it on paying people not to work, or for young chav women to breed. Socialism is what holds us back. Yes, it really works for Spain. NOT. There's an example of a dead economy if ever I saw one. Yes when they tried to revive the Central Line the whining from those, and other assorted nimby's who had turned stations into diserable pwoperdee's s was almost deafening. ....but will our transport infrastructure be ready for the economy turnaround? NOT. Is not China a sort of Socialist Country. and I am glad you are not a strategic planner for the EU. Thanks to the poster - the maglev is a stunning achievement for china and germany. Many of you know I am short on the UK and USA and long on the EU, this is another clear example of why. Germany really has become the lynchpin of Europe, and my predictions a couple of years ago that the Chinese and Europeans would start to marry strategically are coming true. No wonder Germany is pulling europe along like a train. Their society is not based on the filth that run British banking and finance - it's based on wealth creators. Shame on you Britain you deserve what is coming. Rail travel is not economical viable in most instances. The French high speed network is only profitable between Paris and Lyon. It is heavily loss making. Same with Spanish rail network, loss making too. Trains are only economically viable as commuter transport around big cities. Long distance trains could compete better if Airlines had to pay tax on fuel like buses and cars do. China is massively spending on a rail infrastructure where there is no demand for it. The prices are to high and Chinese prefer the low cost slower trains above the high speed ones. Another example of China massively growing due to unsustainable infrastructure and property projects. Beats the hell out of holding worthless $ though doesn't it? China now though is moving inland for workers, the old ports which were growth areas are saturated and pay is going up. So the kelptoists are moving inland to relocate factories for even lower pay. Good God - if we ever had that here it would Laaaaandaners would be only 40 minutes away. Doesn't bear thinking about. It depends on your definition of a 'stunning achievement'. It proves that, given a blank cheque, it's possible to build and operate a 200mph railway. Because the Wikitravel article mentioned it and I'm a bit of a technology sucker, I made sure to take it on my way back to the airport at the end of my conference visit. However, if the taxi driver (who spoke such fluent English as to make me ashamed at only being able to recognise pitifully few Sinographs, and even then only after great effort) I chatted to on the way to the Maglev station at the city end (which was so far out from the city centre that it would be analogous to a high speed line from London to Heathrow starting at Wimbledon), the whole project was an economically disastrous money pit. He told me that the city officials who championed the project to start have buggered any chances they may have had of rising up the party hierarchy, because they landed the city with an expensive and useless millstone around its neck which, in order to save face, the Shanghai ratepayers are still having to pay through the nose to maintain in service. As I wrote above, I rode this thing in a peak evening weekday rush hour - just as you'd expect it to be crammed with business day trippers en route to catch flights home. It was deserted - I was the only passenger in my carriage. The guard who checked my ticket almost had a heart attack when he came across a seat that was actually occupied! If I remember correctly, the ticket cost around £7. A taxi all the way to the airport would have been around £15. Once you've factored in getting out to Longyang Road, faffing about buying the ticket and waiting for the train, the taxi would probably have got you there just as quickly. And if more than two people are travelling, it would also have been far cheaper. If you like impressive gadgets and gizmos, that railway is indeed a stunning achievement. But if you want an efficient and cost effective mass transportation system, it's irrelevant.